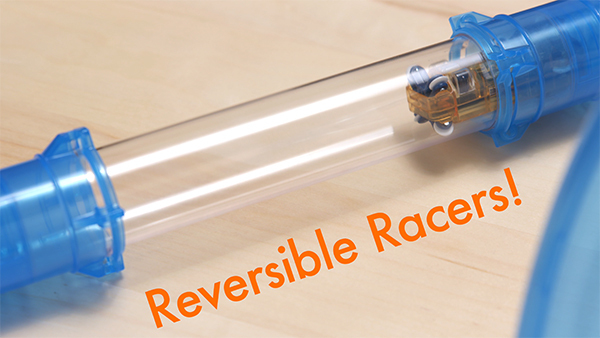 Zipes: Gravity-defying RC racers in tubes. Too late, Elon Musk, Zipes beat you to the punch. 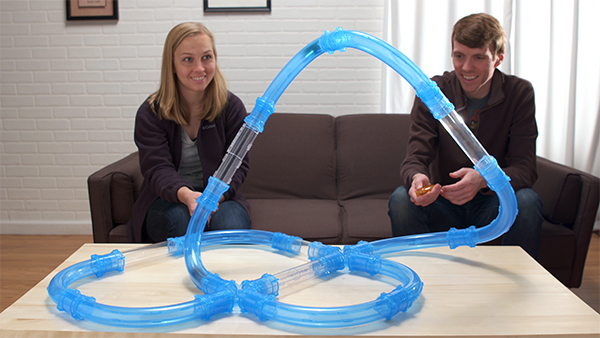 Zip, zag, and zoom your RC Racer through tunnels at crazy speeds that’ll leave you mesmerized. Each Zipes kit includes curved and straight pipes you use to craft a custom course. Make it as crazy, curved, and contorted as you want. 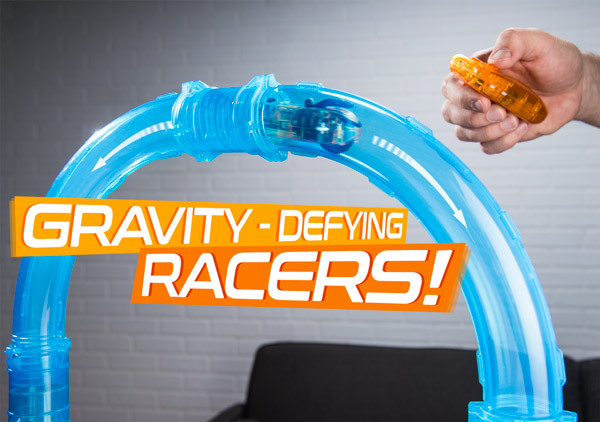 Once you’ve erected your run, drop the Racer into the tube and use your controller to blast the car through the insane cylindrical circuit—even vertically! The light on each Racer combined with the included Cosmic Strobe Ball make racing in the dark an exciting challenge. As your Racer pushes the motion-activated flashing ball along the track, it illuminates the tubes to create a hypnotic light show. If all that gravity-defying speed makes you want to see an epic crash, choose the Duel Barrel Racing Set. The set includes two Racers and two Smash and Crash Intersection pipes that let you witness all the carnage. Watching cars do laps around a flat oval might be fine for auto racing enthusiasts, but it leaves something to be desired in a toy. Zipes is an exciting RC set that takes racing to a gravity-defying new height. The remote-operated cars zip around the tunneled course in an intricate, weaving pattern of your own design. The unique racing toy doesn’t have a backward or forward, an end or beginning, a winner or loser. All you need to do is go fast and enjoy the ride. Get hooked on the speed. 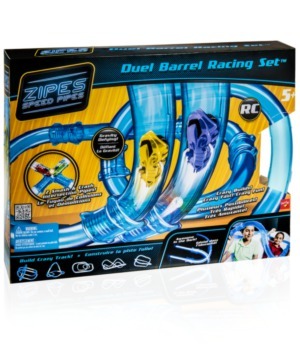 The speed and design of Zipes let you do things you never imagined possible in a racing set—including going vertical! To get started, add your car to the tube through the door in the starter pipe. Press down on your remote and your car will leap into action, darting around the tube in whatever direction you want. Build your track as high as you can, and your car will still rocket to the top. You’ll love watching the racers navigate the seemingly-impossible track at breakneck speed. Because there’s no set beginning or end point in Zipes, you can create your course however you want. With the freedom to design, you can build a new circuit every time you feel like revving your engine. After making your course, control your racer around the crazy curves. Pick up the Duel Barrel Set to chase your opponent around the track, play tag, or simply see how many times you can crash. Make your own deadman’s curve. 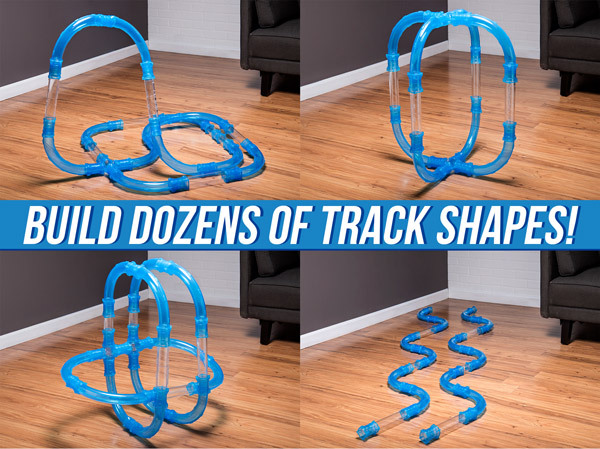 Creating your own race track is easy with the Zipes racing tubes. 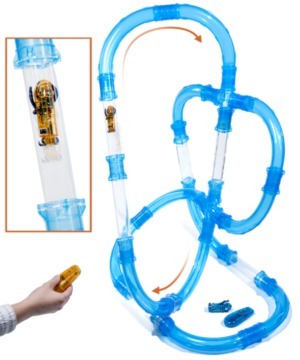 The plastic pieces snap together easily so you can quickly build the course of your choosing. 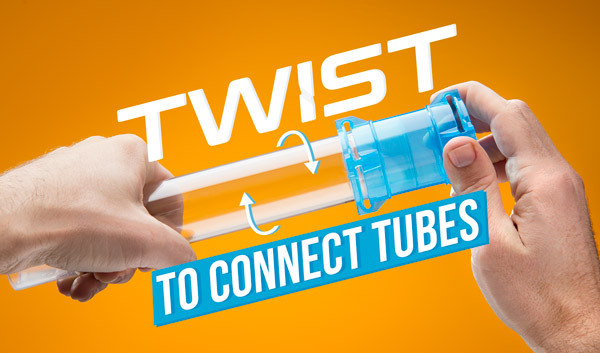 When you’re ready for a new thrill, the tubes come apart so you can quickly reconfigure and watch the new result. As any car commercial will show you, there’s something undeniably cool about driving at night. 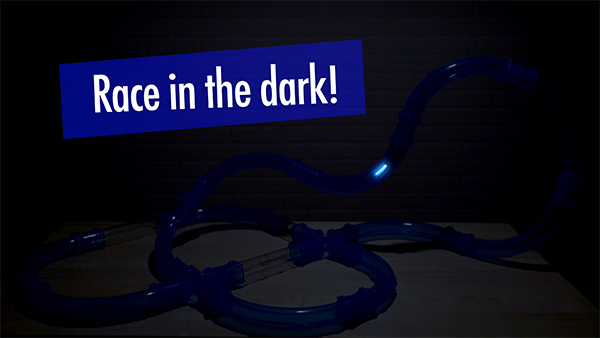 Zipes is specifically designed for after-dark racing, with light-up cars and a motion-activated strobe ball that lights up as you push it around the track. Turn off the lights during your race and watch the cars become blurs of light that create mesmerizing moving patterns in the darkness. It gives your driving a futuristic feel (or how we hope the future looks, anyway). 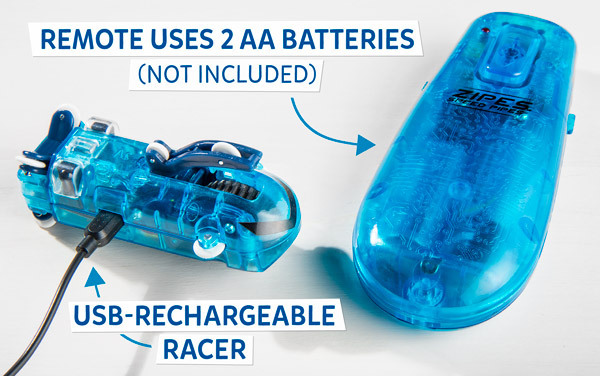 When your Zipes racer is zapped from all that speeding, don’t worry about digging new batteries out of the junk drawer. Instead, plug in your racer using the included USB cable to quickly charge up for the next exhilarating run. Keep it charged with the included USB cord. The Zipes remotes don’t make you overthink your driving, freeing your mind to concentrate on the fun. The remote only has two buttons, which propel your car forward or backward (even switching between the two directions with impressive nimbleness). The cylindrical design of the track means you don’t have to worry about steering. And, of course, there’s no brake (‘cause that would just get in the way of the fun). 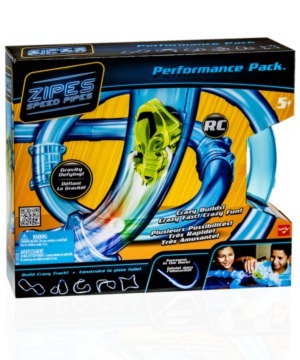 Zipes is available in two sets: the Performance Pack and the Duel Barrel Racing Set. 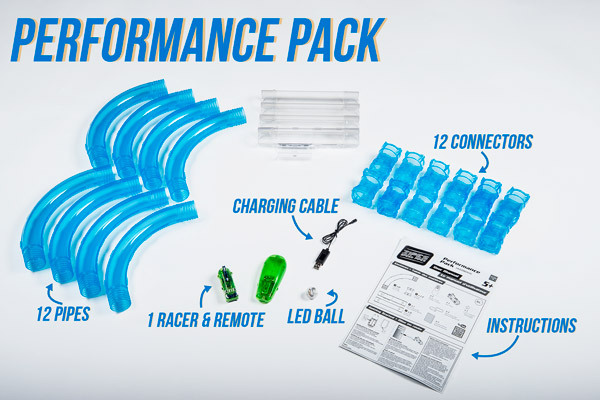 The Performance Pack includes a Zipes rechargeable racer, motion-activated cosmic strobe ball, 8 curved pipes, 3 straight pipes, 1 straight starter pipe, 12 connectors, remote control, USB charging cable, and instruction manual. 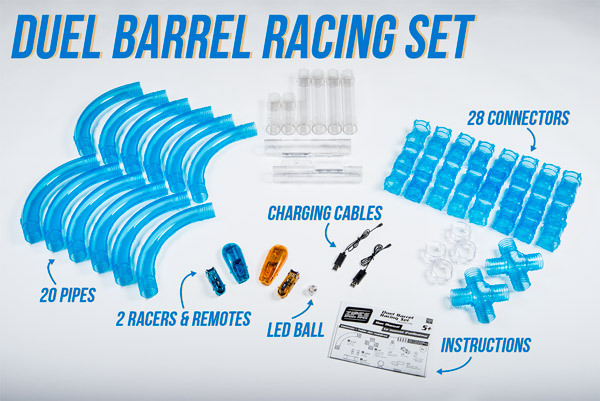 The Duel Barrel Racing Set includes 2 Zipes rechargeable racers, motion-activated cosmic strobe ball, 12 curved pipes, 2 short straight pipes, 2 long straight pipes, 2 starter pipes, 24 connectors, 2 smash and crash intersection pipes, 2 pipe to pipe clips, 2 remote controllers, 2 USB charging cables, and instruction manual. Pick your set and start racing! Question: How do they go all upside down and stuff? Answer: Each Zipes racer has a single large wheel for propulsion and eight smaller wheels to maintain contact with the tube. Question: I’m not a safety expert, but a “smash and crash intersection pipe” sounds dangerous. Will it break the racers? Answer: The crash takes place inside the tube so there’s no risk of flying debris. The racers themselves are designed for the crash, so they will continue to work just fine. Question: Can you control the speed? Answer: The Zipes racers are designed to have one speed: fast. That being said, you can somewhat manage your speed by intermittently releasing the button on the remote.